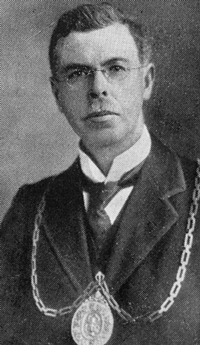 In 1885 Provost William Bryson sounded out a number of people in the town about the adequacy of the existing public halls, and they had confirmed his suspicion that something better was required. Consequently a committee was set up to raise funds for the construction of what at that time was called "The New Town Hall". Three sites were considered as possibilities. One was beside the municipal buildings in Sinclair Street — presumably where the municipal buildings extension was subsequently added in 1906 — but this was deemed to be too small. The second was in Colquhoun Square, but this was too expensive. The third was in Sinclair Street beside the Mallig Mill on land belonging to the Colquhoun Trustees. Initially they were looking for something in exchange, but then decided to make a generous gift of the land, and so the Victoria Hall came to occupy the present site. Needless to say, it was proving an expensive venture. On September 1 1886 it was reported in the Helensburgh and Gareloch Times that the estimated cost had gone up, and was now standing at around £3,500. At the same time sealed offers were received from contractors. 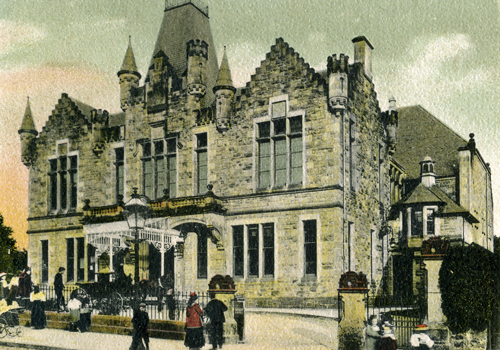 A visit to Cumnock Town Hall had impressed the committee, with the result that they appointed that building's architects for the new hall; consequently it came to be designed by the firm of J. & R.S.Ingram of Kilmarnock. One week later the names of the successful tradesmen were revealed. It was also revealed that the estimated cost, including painting and furnishing, now stood at £4,100, but only £2,700 had been subscribed to date. Despite this, it was reported that "the builder has already broken ground". It did not take long for the first problem to materialise. On September 15 it was reported that "Mr Miller, contractor for the mason work, has asked to be relieved of the contract, alleging that his offer is too low when the advanced state of the season is taken into consideration; his men cannot work continuously in winter and a week of weather such as we experienced last week, had operations been further advanced, would have caused a heavy loss to the contractor". Two weeks later a new contract had been awarded for the masonry work. Despite a report in the newspaper on November 17 1886 that both the building and fund-raising were proceeding well, the edition for January 26 1887 contained a letter from Provost Bryson appealing for funds. The new building was now being called "The Jubilee Hall", 1887 being the Golden Jubilee of Queen Victoria's accession to the throne. However this new name lasted no more than one month as the paper reported on March 2 1887 that it was now called "the Victoria Hall" (singular). Furthermore a committee to organise a fund-raising bazaar had been nominated. The big event took place on April 23 1887 with the laying of a memorial stone with full masonic orders. This ceremony was preceded by a procession through the town which included: 5th Battery, 1st R&DA (Renfrew and Dumbarton Artillery Volunteers); "A" Coy, 1st DRV ("A" Company, Dumbartonshire Rifle Volunteers); the Fire Brigade; the Free Gardeners; the Oddfellows; the Shepherds; the Police Commission; the Masonic Lodge; the Provincial Grand Lodge; the Cumberland Band — consisting of boys from the training ship "Cumberland" moored in Rhu Bay — and the Chief Constable of the County. The memorial stone was hollow and contained a set of coins, a Helensburgh directory, newspapers, a list of the names of subscribers, etc. Over it was placed a brass plaque inscribed as follows: "By the favour of Almighty God, on the 23rd day of April AD 1887, and the era of masonry 5887, and in the Jubilee Year of the reign of our beloved sovereign, Queen Victoria I, this memorial stone was laid by John Maclellan Martin of Auchendennan, RWPGM, Dumbarton". Auchendennan is now the Loch Lomond Youth Hostel. The stone was "laid in accordance with the rules and customs of masonry". The ceremony was followed by a banquet with many toasts. Unfortunately the whereabouts of this memorial stone are no longer known, the brass plaque having disappeared. 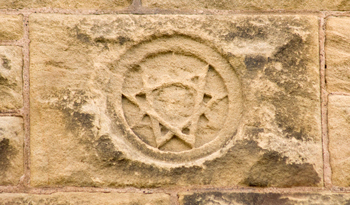 There is however a stone on the west front of the Victoria Halls about halfway up the building which has what appears to be a masonic symbol engraved on it. Is this the memorial stone itself, or is it in some way connected with it? By the end of the year work was obviously proceeding apace and so the post of hall keeper was advertised. At the start of November it was recorded that there had been 80 applicants for the job, and three weeks later an appointment was made. The official opening of the Halls took place on January 17 1888. It took the form of a "Musical Promenade when Subscribers and other Friends may inspect the Building. Mr Ingram's Quadrille Band will perform". Speeches were made at this free event and it was remarked that with one exception all the building trades came from Helensburgh; they were Messrs John Jack, mason; McKinlay and Son, plumbers and gasfitters; Donald Dempster, slater; William Thompson, plasterer; Sillars Brothers, painters; and J and W Bain, blacksmiths. The joiner was McLetchie from Kilmarnock. At the opening Provost Bryson announced that the total cost was £5,000, of which £4,300 had been raised — and of that £2,000 had come from William and Richard Kidston. Consequently the next two events were not free! On the January 18 there was a "Grand Concert by Lady and Gentleman Amateurs" and two days later a "Grand Subscription Ball" which included supper and refreshments. In 1899 architect Alexander Nisbet Paterson altered and renovated the building to mark the 62nd year of Queen Victoria's reign and the 80th year of the Queen's life. The interior of the building was renovated by the Town Council in 1935 to mark the silver jubilee of the reign of King George V, the cost being met by Provost Andrew Buchanan, who was a generous benefactor to the town. Around 1940 the railings in front of the hall were removed for the war effort, but they were reinstated following a fund-raising campaign by the Friends of the Victoria Hall to mark the bicentenary of the burgh in 2002.